Just starting out with charcoal drawing? Looking for some good tips to help you get started? The following is a series of videos collected from YouTube that covers some of the basics, techniques and other great tips for beginners interested in getting started in the charcoal drawing medium. Enjoy! This first charcoal drawing lesson talks about the supplies you are going to need to get started, like pencils, blending tools and erasers. Thanks to William Cotterell from Expert Villiage for making this video. William Cotterell graduated in Seattle where he has been Art Director, Creative Director, and Senior Designer and Visual Communications for various national firms. This second video tutorial talks about the types of paper that are available for use with this medium. This video again features William Cotterell from Expert Villiage. 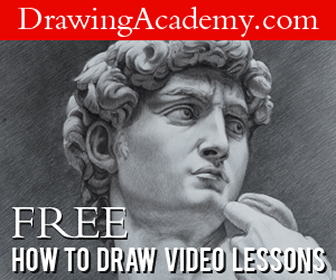 This video demonstrates how to use the subtractive drawing technique. This is a very interesting and enjoyable technique to try our in your next drawing. In a nutshell, the subtractive method is the process of first laying down a layer of charcoal and then using an eraser to create the lightest values of the drawing. for christmas and this was very timely. Does William Cotterell have a gallery of his own works? Or a website that might show his own art work? i am sort of playing around with the art of drawing with charcoal and i’m having a problem with smearing. is there a way or substance that can be used so that when finished,the black doesn’t smear into other colors? please e-mail me at the e-mail address above. actually I am drawing St.TERESA and since she is wearing a habit,the black in mixing with the white… thank you for your time. looking forward to hearing from you. Erasing charcoal – sounds weird but when I run out of the charcoal eraser / gummy and don’t want to stop -I grab a piece of bread and use a small piece to erase or tone down the charcoal. Works! try it..